6 packs of 3 oatcakes. High fibre. Wholegrain oats. Tasty flaxseeds for flavour and protein. Wheat free recipe. No GM ingredients. No hydrogenated fat. No artificial colours, flavours or preservatives. 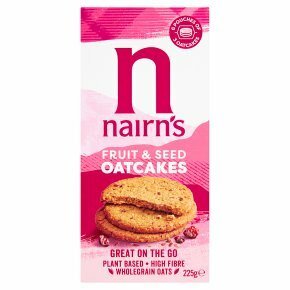 Suitable for vegans.Naturally Energising Nairn's Fruit & Seed Oatcakes are packed full of wholegrain oats which are naturally delicious and wholesome, and can contribute to a healthy balanced diet. Wholegrains are a rich source of fibre, vitamins and minerals - oats are high in soluble fibre and also naturally contain manganese**, phosphorous**, magnesium, zinc, iron, folate, vitamin B6 and thiamin. Delicious on their own Our delicious Fruit & Seed oatcakes have been designed for eating when you're out and about, so they don't need a topping! Loaded with wholesome oats, currants and flaxseeds, they are a tasty snack with plenty of crunch for any time of day. Packed in pouches of three, they're handy for breakfast on the go, a pre or post workout snack, at your desk or in lunchboxes. Our oatcakes contain nutrients** that contribute to normal energy-yielding metabolism.